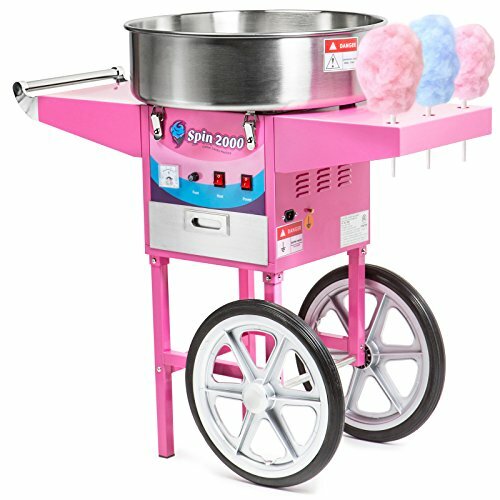 The SPIN 2000 cotton candy maker cart from Olde Midway makes it easy to create fun, fluffy cotton candy. This commercial grade mobile machine features a large stainless steel bowl, high performance belt driven motor, a 3-bin storage drawer, and an industry leading 950-watt high performance heating element. The large stainless steel bowl looks great but also keeps the working area safe and is detachable and thus very easy to clean. This machine is designed to limit vibration for quieter operation utilizing an upgraded belt driven motor and four clamps to hold the bowl steady. Our enhanced 950-watt heating element can complete a batch of cotton candy in about 30 seconds once heated (which only takes 2-4 minutes when you first turn it on). We have designed this cotton candy machine to be as simple and easy to use as possible with just 2 switches (Power and heat) located right on the front of the machine. The 13" ball bearing wheels make moving the machine easy. We have combined a nostalgic look with today's technology for a machine that is ultra-quiet, easy to use, and easy to clean. This is perfect for churches, schools, fundraisers, varsity clubs, birthday parties, concessionaires, and anyone else looking to make cotton candy quickly and efficiently. Also included is a scoop, owner's manual and spare parts kit. Dimensions: 20-1/2" Length x 36" Width x 37" Height and weighs 36 pounds. Operates on a US-standard 120 volt power cord.